I hope this Holiday greeting finds you and your family well as we hopefully slow the pace in this season of celebration! What a year it’s been for all of us and I think you’d agree that its been full of opportunities to climb some pretty huge mountains. This year has been so challenging, but let’s not forget that it’s also come with rewards, maybe they just look a little different than we were all used to. . . Instead of Ease – words like Perseverance have taken it’s place, instead of Sheer Abundance – words like Gratitude and Simplicity and instead of accidentally taking People/Things for granted – hopefully our thoughts linger a bit longer on those things that truly last, Family, Faith, Freedom. As the Structures Team reflected over the last year, we looked at the huge challenges and then we counted the blessings we carry with us from 2009. From that reflection came some of the words in our photo. 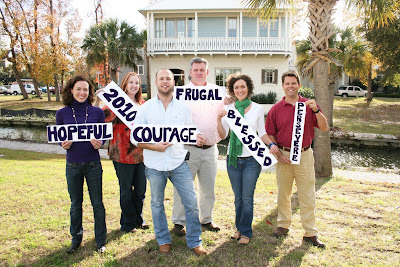 Words that helped to carry through this year and we’ll take with us into 2010! We stand with smiles, not because this year was a piece of cake, but because in light of the challenge, there is still so much to be grateful for! What would be your word for this year?